I will write. I have strength enough for that, at least. Picked up by spider caravan, out on the Greensea. These spiders are their own wagons, and there are no beasts of burden here, though I am a beast, and I am a burden. Like a coffer full of spices, or their new-hatched young, I am latched to a spider’s back, forced to bear the unsteady rise and fall of the world. Unpleasant as it is, I am not ungrateful. Throughout the day I saw spiderlings spin silk for flocks of geese we follow. Gossamer threads in the air, here a lasso, there a net. One tried to rope the sun. I watched it toss the silk, pull the day down till the orange hills turned black. I will not write of where I come. The caravan is southbound, out beyond the Greensea to the insect cities where we do not tread, so I too am southbound. That is enough for now. A day of spiderling airships. Two dozen birds harnessed in kites. Silk so fine it is roped between the wings. Offered a tied goose to hold. Weak though I am, I broke the panicked bird’s wing while it fought against my grasp. The bone beneath my fingers felt so brittle, made me conscious of my hands, how strong they grow, how the little hairs on the surface feel against the Greensea’s winds. Afternoon: a group of spiderlings moved upwards, carried off by frantic feathered kites. 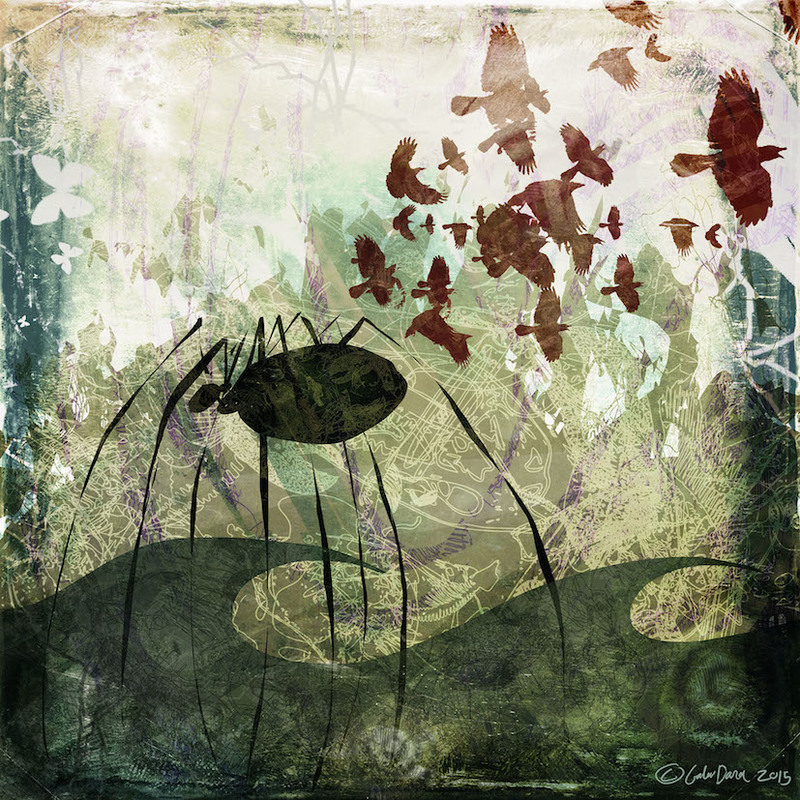 All those legs, of birds, of spiders, kicking a dozen different messages. No one said goodbye, but all eyes were on the horizon. The spiders will not speak to me of where those young ones go. They will not speak to me at all. I know my legs again, the Greensea’s feel beneath my feet. The chelicerae of even the smallest spiders could tear my leg. They love to knock my hat off, toss silk on my head. Flies catch in my hair. I picked them out, offered them like sweets to the youngest on their mothers’ backs. They took them without thanks. You are matron to them. Broodmother. I guess I should thank you for that. Not I. That was another. Why did it help me? You were crawling. Not on two, and not on eight, but still on four. Yes, but you pressed on. No, we know that is not your reason, truly. What is it you seek, out here in the Greensea? You wished to escape, for your past to feel as dull as the soles of your boots, smoothed into unrecognition by distance travelled, yes? That. That is why we took you in, because we saw, deep down, you are a spider. The spider that carried me, when I was weak and still now when my legs give way, I had not thought to thank it. I did so this morning. I carried you today. Yesterday was another. When I asked after its name, it said only I am Spider, as do they all. Each day a metamorphosis. The leading spider alternates come sunrise. With the shift the old spider shrivels before my eyes, legs splitting, realigning for shortened steps, a less imposing stature. The newcomer elongates, expands its stride, its abdomen swelling twice its size, its eyes giving off the sheen of polished obsidian. Evening. A buffalo dressed in white hung between us. I watched its eyes, its two eyes, brown, like mine. The spiders built a fire, roasted a haunch for me. All those eyes as I ate. The buffalo seemed a close relative in contrast to my hosts. All around, chelicerae worked at meat. Having lost my knife, I only used my teeth. Later, a spider quartet spun stringed instruments from their abdomens, played with arthropodic grace. Another spun stories. Chelicerae clicked throughout the caravan, subtle conversations that eluded me. I hope to learn in time. Fragment translated by the day’s column leader: And Spider wove a web across the blue and black, caught and keeps the fires there to light our paths, suspends the moon and sun for us in nets. But she tires. Oh, she tires. She has been holding on so long. Today you will rope the moon down for her, to let her rest her weary legs, and tomorrow you will rope the sun. The spiderlings: a thousand unblinking eyes wide with awe. Outside the ring, spiders danced, their legs shifting in a crazed choreography. Told, In the morning there will be a corpse, and by the bones another caravan will know stories here were told. Looking back, I see an enterprising spider leaves silk trails in the caravan’s wake. They told me: Dust devils sometimes gather the threads into concentric circles. No journey ever finds silk unbroken. Watching me, another said: Do not look back. There is nothing in your wake, only the Greensea. Now is south, and whatever that means to you. Do not look back. Dreamt the stars were raining down, each one a horse, bridle shining in the black, the buckles and belts and pistols of the men riding them a beacon in the night. There is nothing in my wake. Mornings are the claustrophobic comfort of silk cocoons. A spider has taken to wrapping me in my sleep. Or perhaps it is them, all, and I sleep in the essence of their community. I think I am learning to forget. And, perhaps, what it means to belong. Even the Greensea ends. Soon we will reach the first of many jewelled beetle cities. It is warm, and welcoming, even for your kind. You might find peace there. But you do not believe I will. And next you are headed east. Yes. But there is further south, still, and west. East for you could wait. Was I wrong to think I am welcome among you? At that the spider shrugged, a movement that screamed not indifference but a knowledge of such things. I did not say it was not so, or that east was ill chosen. There are wonders, out beyond the beetle city. Myself, I would not settle there, or ever. I would move, as you do now, as Spider does, and bids. I asked, Would you come with me? It felt a strange question. I did not know this particular spider, any more than I knew the others. There was only the general sense of companionship they as a group had fostered. No. The world moves, and Spider moves the world. She cannot move the world alone, and I would not relinquish my duty to her, to the caravan. But you, you are a spider, and not. The beetles, they too are spiders, and not, though in their armour and their comforts they tend to forget. Those who follow Spider learn the language of travel, which is change. Stay, with us, with the beetles, and in time and comfort you will find only yourself. Someday, perhaps, but that is not a thing for now. A quintet on this final night. I played the flute, a tibia gifted me by the spiders, hollowed out by my hand. I do not know its provenance, spiders have no bones. Perhaps it came from a man, something out of the Greensea, or of a place beyond that. This is a thing of Spider, a thing of travel. It has known change. It knows it still as you play. My flute helped weave invisible threads in the web that is now us. Our notes caught in the black spaces between, illuminated the night like melodious fireflies. My mouth on that alabaster relic was the taste of kin on my tongue. Later they and I will play, in camps divided by the vastness of the Greensea, or the beetle city, or whatever else stands between us, and, looking at the sky, we will know that we are spiders. Though, perhaps I will be something else entirely by then. Dominik Parisien is an editor, poet, and writer. His fiction and poetry have appeared in Strange Horizons, Shock Totem, Ideomancer, Tesseracts 17, Imaginarium 2013: The Best Canadian Speculative Writing, and other venues. He is currently editing Clockwork Canada, an anthology of Canadian steampunk forthcoming from Exile Editions. Dominik also provides editorial support to Cheeky Frawg Books, is the poetry editor for Postscripts to Darkness, and was an editorial assistant for Weird Tales. Galen Dara sits in a dark corner listening to the voices in her head. She has a love affair with the absurd and twisted, and an affinity for monsters, mystics, and dead things. She has illustrated for 47 North, Edge Publishing, Lightspeed Magazine, Fireside Magazine, Apex Publishing, and Goblin Fruit. Recent book covers include War Stories, Glitter & Mayhem, and Oz Re-imagined. She was nominated for the 2014 Hugo Award for Best Professional Artist. You can follow her on twitter @galendara.